4 Paving the way for new research in disease prevention? We have all heard the annoying buzzing of flies around the house and experienced the nuisance value that the common housefly can bring, especially with regard to food that is left open. It is common knowledge that the housefly can carry serious disease-causing microorganisms that can result in deadly diseases such as typhoid, dysentery and cholera. Houseflies are known to carry over 100 pathogens. 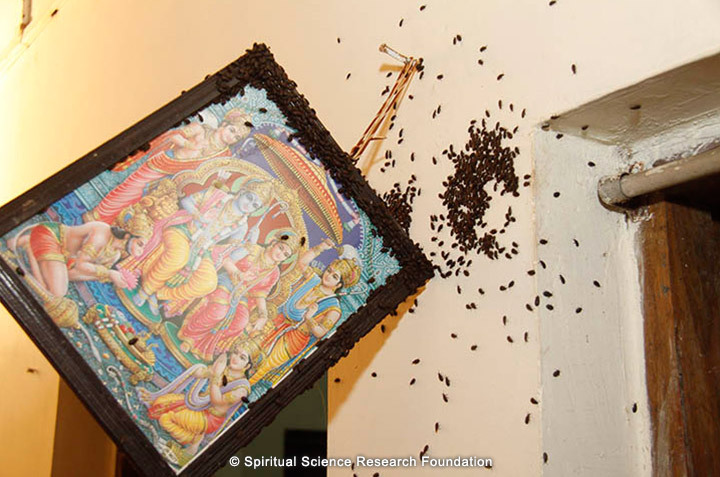 What is not common knowledge, however, is that the common housefly and other insects such as cockroaches and beetles are spiritually impure and emit spiritually impure vibrations. 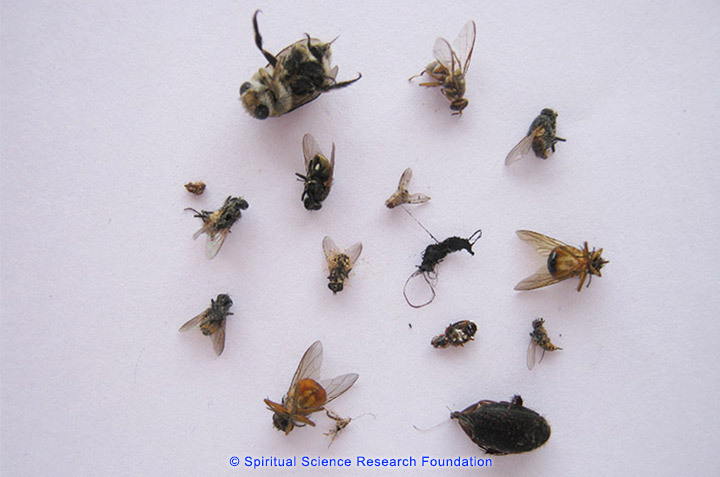 Negative energies from the spiritual dimension can sometimes use these insects to adversely affect people and increase the spiritual impurity in the environment. During the course of our research, we came across a farmhouse that was attacked by negative energies. One form of this subtle-attack was that the house would be invaded by swarms of insects year-after-year during the monsoon season. A large spider nest was discovered very near the farmhouse, and the hordes of spiders that emerged from this nest were very unusual. The house itself was attacked by swarms of insects. You can see the scale of insects that were found crawling all over the house, forcing the residents to vacate the premises as it became uninhabitable until pest control measures were applied. It was also noticed that they specifically congregated on objects which were spiritually pure. For example, pictures of Deities and name strips of Deities were attacked the most, and were full of insects. Even when we look at the above photographs, we can perceive negative vibrations being emitted from them because these insects are spiritually impure. Nowadays, there are various pest control measures at our disposal to control pests. However, during the course of our research, we came across a phenomenon that sheds new light of a possible natural deterrent to such pests. The room of His Holiness Dr. Athavale, who is a Saint of the Highest Order, has very high levels of spiritual purity. Many Divine phenomena such as Divine particles, Divine perfume and subtle-sounds originated in His room, which is in the SSRF Spiritual Research Centre and ashram at Ramnathi in Goa, India. What we noticed is that if a fly accidentally enters H.H. Dr. Athavale’s room, it soon becomes disoriented. The fly stops flying and instead walks around slowly on the floor. Sooner or later its walk begins to get feeble as if it is in a drugged state. Even if prodded, the fly does not respond to the threat. After a couple of hours we have observed that the fly rolls over and dies. This is quite unique considering that the life expectancy of any normal housefly is generally between 15 to 30 days depending upon temperature and living conditions. Yet, when a housefly enters the room of H.H. Dr. Athavale, within 15 to 20 minutes it is observed that its movements become very sluggish and gradually it is not able to move at all. In about a two hour timespan from entering the room, the housefly dies. This is a picture of some of the various insects that have died within a short time of entering the room of H.H. Dr. Athavale. We have also observed that the same phenomena repeats itself in other rooms in the Spiritual Research Centre such as in the Ashram temple room. This simple observation may indeed have far reaching implications and opens up an aspect of healthcare that could well save governments millions of dollars in disease prevention. Given that flies can be bearers of 100 or more pathogens, we wonder whether the same effect seen in flies in a spiritually pure environment also impacts the pathogens that it carries. We would like to share with our readers a few more examples and some spiritual science behind this phenomenon. 1. 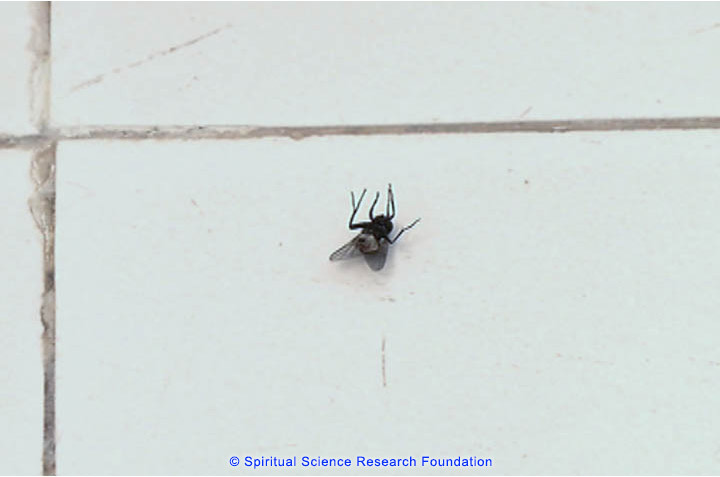 Through spiritual research, we have found that spiritually impure species such as flies and insects cannot live in spiritually pure environments, such as H.H. Dr. Athavale’s room. When we practice Spirituality on a regular basis, we increase our spiritual purity and the spiritual purity in the immediate environment. This acts as a natural deterrent to germs and insects that are spiritually impure. 2. We were also intrigued when we heard a scientific observation (albeit many decades ago) about the river Ganga which is the most important and revered river in India. Its waters are considered Holy and spiritually pure. Dr. F.C. Harrison of McGill University in Canada states, “A peculiar fact has never been satisfactorily explained is the quick death in 3 or 5 hours of the cholera vibrio in the waters of the river Ganga.” Another well-known French physician Dr Félix d’Herelle had also made similar observations. 3. Spiritual research conducted by SSRF on the river Ganga shows that even in 2014, despite the high levels of physical pollution, the waters of the river Ganga maintain its timeless levels of sāttvikta and spiritual purity. The Ganga’s spiritual purity is minimally affected by the physical pollution. This can be better understood by the following analogy. A Saint’s physical body, even if dirty or ill, will minimally impact the Divine consciousness emanating from Him or Her. This is because the spiritual level or spiritual purity of a person is separate to the state of the physical body or its appearance. 4. 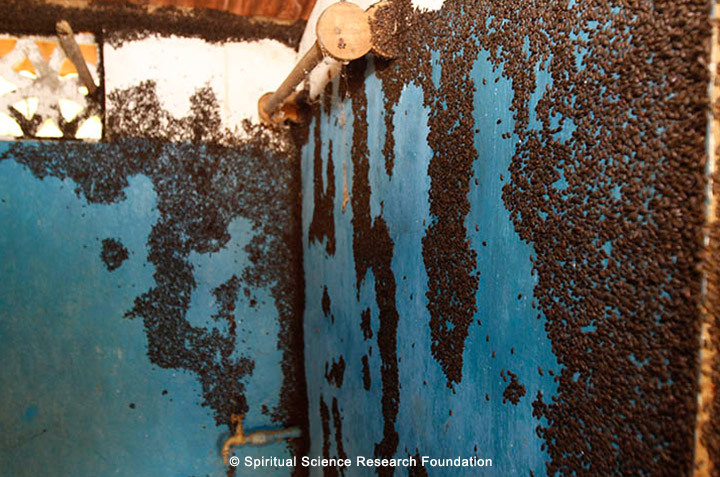 We also observed that when we sprayed Holy water on the insects in the farm house they immediately started to disperse. Also, when we blew small amounts of Holy ash on the spider nest they immediately began to disperse. Yet it was only after a specific ritual based on the Rigveda was done on the premises that the insect attack stopped for the first time in 2014 after many years. 5. There was another resident who complained of a severe case of bed bugs which was unaffected by nine rounds of pest control. The problem subsided when the tenants started to chant Shrī Gurudev Datta, applied strips of paper with the Deity’s Name on their walls, blew Holy ash and lit incense sticks. On the other hand, butterflies (even though they are part of the insect species) displayed a different behaviour in the premises of the Spiritual Research Centre. Instead of dying they are found playfully sitting on the seekers in the premises. This is because through spiritual research, we found that butterflies are sāttvik or spiritually pure insects. 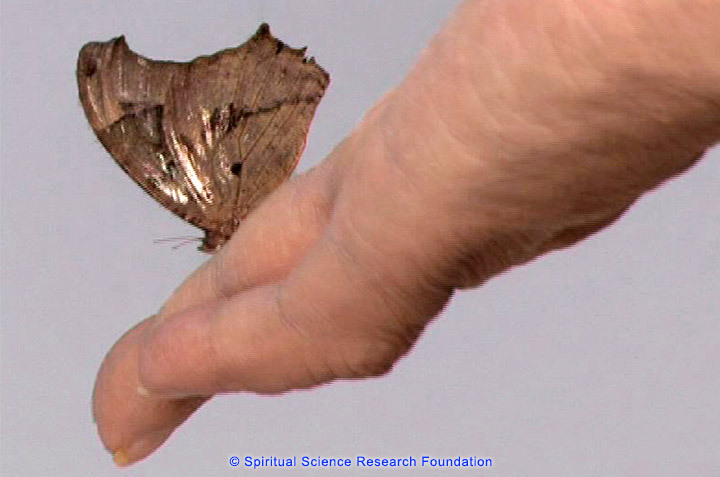 As like attracts like, butterflies, which are spiritually purer amongst insects, naturally gravitate to the spiritual purity of the Spiritual Research Centre. When one butterfly found its way into the room of H.H. Dr. Athavale and sat on His fingers, its wings turned luminescent. Could all these observations of germs and insects spontaneously dying be linked? And if so, what does it mean for disease prevention? SSRF appeals to scientists to help us study this phenomenon in more detail. 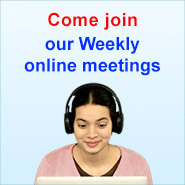 Scientists and researchers in this field are welcome to contact us through the login functionality by posting a comment. This article is a part of the series of articles where we are covering The Spiritual Research Centre and Ramnathi Ashram – A building that is beyond the 7 Wonders of the World. 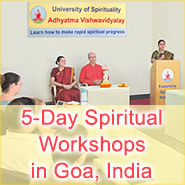 It is a place where hundreds of spiritual phenomena both positive and negative occur – all under one roof.